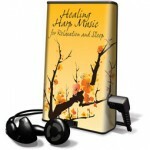 This MP3 Player is pre-loaded with four hours of instrumental music by Tami Briggs, therapeutic harpist. It features outstanding sound quality, compact design and it’s easy to use. Click here for more information. This guided imagery CD explores the challenges and opportunities of menopause and mid-life. Tami co-created this CD with Glenda Cedarleaf, Clinical Hypnotherapist and Licensed Psychotherapist. Glenda’s soothing voice and Tami’s relaxing music guide you on a contemplative journey to settle your nervous system, navigate this transitional time with greater clarity and calm, and help you sleep. Click here for more information. This inspirational book features 31 gifted healers from around the world. In sharing stories of empowerment, wisdom, and life learning, their voices of vibrancy speak of the power and resiliency of the human spirit, doing extraordinary things to help create a better world. Click here for more information. Enjoy a four-minute mini-retreat from your daily routine with a rejuvenating blend of stunning nature photography by Bernie Saunders and Tami Briggs’ relaxing harp music. Renew your body, mind and spirit! Click here for more information. This tiny audio player is pre-loaded with five hours of Tami Briggs’ beautiful, relaxing harp music. 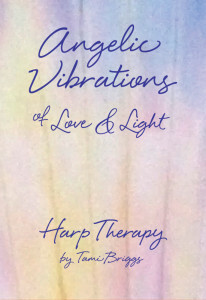 “Healing Harp Music” is easy to use, portable, durable, and lightweight. Click here for more information. This six-week on-line course is designed to promote feelings of deep relaxation and peace, and to facilitate life reflection and review. Each week, you will receive an e-mail that includes: 1) a guided meditation co-created by Barb Thune Schommer, registered nurse and Healing Touch instructor, and Tami Briggs, therapeutic harpist, 2) contemplative exercises, 3) practical applications, 4) reflection with healing music, 5) affirmations, and 6) homework. Click here for more information.